If there's anyone who thinks tasty BBQ chicken and veggie fajitas are restaurant-only fare, we're out to change your mind with this how-to video! Combine chicken, vegetables and barbecue sauce. Let stand 5 min. Poke holes evenly in bottom of 13x9-inch disposable foil roasting pan with fork or skewer. Place chicken mixture in pan; place pan on grate of grill. Cover grill with lid. Grill chicken and vegetables 20 min. or until chicken is done and vegetables are crisp-tender, stirring occasionally. 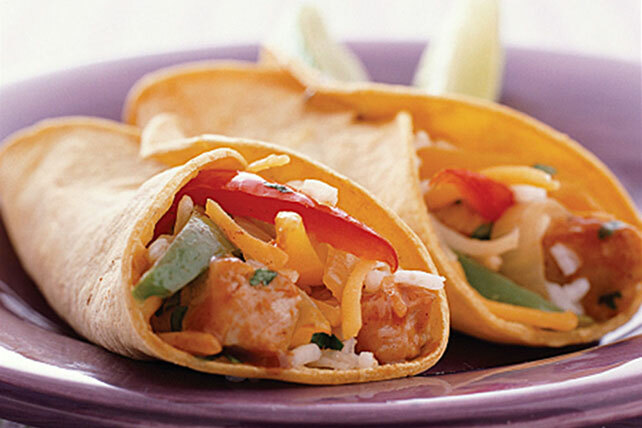 Spoon onto tortillas; top with remaining ingredients. Roll up. Substitute a stir-fry basket for the foil pan. Reduce grilling time to 7 to 10 min. Place chicken and vegetables in resealable plastic bag. Pour sauce into bag; seal bag. Use your fingers to massage the bag to evenly distribute the sauce.